Australia’s largest food fest returns to NSW. Taking place around the country, the Sydney Good Food Month dates run for the whole month of October so you now have two week’s warning to scale back on the fridge consumption, in anticipation of glutton overload next month. Partnering with the Sydney Morning Herald, the culinary scene will be in abundance so your taste buds can run into overdrive, right from the 1st through 31st. Oldies but goodies will be revived including the Asian inspired Night Noodle Markets (get that ramen ready!) and the Shoot the Chef photo competitions on culinary masters. Then there’s the Good Pub Grub, Bar Hop cocktail and snack combos and Ultimate High Teas (even though the Brit’s stopped calling this a long, long time ago and just now refer it as a ‘cuppa’). The city will feature a huge array of pop up dining areas, parties and hands on cooking classes. So if you can’t boil an egg and want to know the best thing to happen since sliced bread, this is the month to get your kitchen chef’s hat on (or your spork at the ready) and lock in event diary dates. A few of our favourites include the Long Table Lunch. This is on October 23rd at 12.30pm at The Star, 80 Pyrmont St. For $199 per person, you can feast on eight course sharing menus with matched Yalumba wines. Our favorite is the Sugar Rush category of activities. From Chocolate & Rhubarb Delight (the most incredible combo invented) to Sweet Childhood Memoirs, Never Ending Sugar Glory and Magical Chocolate Dessert events. We suggest you pop in for a dentist check up before you check out these tastings. That crown won’t hold itself, nor the filling or the cavities but it’ll be worth every bite. This image below…it’s actually a cake. We know! 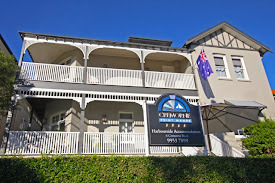 As Cremorne Point is located in a leafy, brilliant walking neighbourhood, for visitors heading to Sydney (or locals wanting a staycay), why don’t you book yourself into Cremorne Point Manor? You can get the best of both worlds – indulging in incredible culinary plates and then walking it off. The calories won’t burn themselves off…we know from experience. Enjoy and get ready to eat!